Who are these peregrinating Pratts? The traveling adventures of a family that refuses to wait until the kids are old enough. « Come Play in My (and Your) Backyard. When it comes to keeping my kids busy on a flight once the seat pocket contents have lost their novelty (hey, that emergency instruction card is essentially a board book about inexplicably calm people enjoying various aviation disasters), I want the things we bring to meet three criteria. First of all, they must be light and flat. Because the heavy and bulky luggage category is already overrepresented on any trip with kids. Second, they must be inexpensive. Because the expensive category is similarly overrepresented in that square foot of space under their little bums. Third, it can’t have a ton of pieces—or at least not a ton of necessary pieces. If it falls on the floor and migrates three rows in front of us, I want to let it go. Whenever we find an activity that meets all three of these requirements, celestial choirs sing. Our two current favorites work so well that I scrapped the idea of working them into a Top 10, Top 5, or even Top 3 list. Forget the filler. Here are the two greatest in-flight toy ideas we’ve come across in a long, long while. Ingrid makes a gel cling snowman on her window. Instead of making a ruckus in her row. You know these things. They’re those perennial dollar and craft store items that look like thin-sliced Jello. They’re meant to decorate windows. And guess what your toddler has right next to her? Yes, a window! And when that gets old, they’ll also harmlessly stick to tray tables, in-flight magazine covers, and just about anything else. Just keep a close eye on very small people, because they do look deceptively edible. Much like airline food. Wikkistix and Bendaroos are essentially identical competing products. There are also a host of knockoffs on the market now as well. In fact, you’ll probably find some within a few feet of the gel clings at your favorite discount shopping spot. What are they? 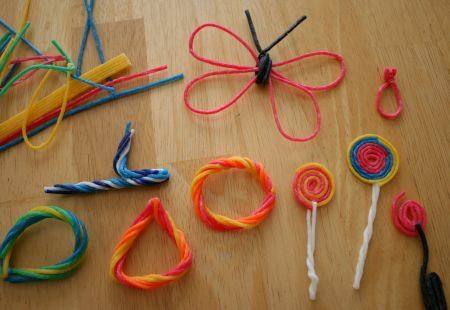 Imagine if modeling clay and a pipe cleaner had a baby, and you have a general sense of what these colorful, flexible sticks can do. They’re actually colored yarn dipped in wax, but they’re way more fun than that sounds. Not only can they be bent and shaped like wire, they also stick to themselves and any other smooth surface without making a mess. You can fashion them into all kinds of two- and three-dimensional forms and they’ll stay put. Plus, they’re endlessly reusable. On a recent flight, I cracked up realizing that all four of us across our row were utterly engrossed with them. Ingrid was balling them up and sticking them to her tray table. Anja was making me an elaborate necklace. I was weaving them into a basket. And Andrew was making a 3D stick family. Not bad for a toy that could easily fit inside an envelope. 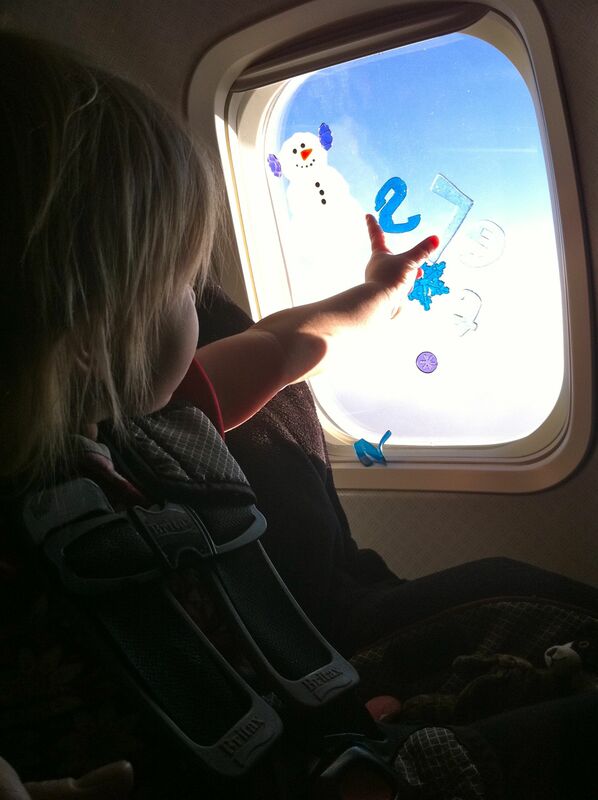 Got any more must-have inflight toys? Then hook a fellow family traveler up by posting your tips below. Puzzle Buzz! It is a kids activity magazine put out by Highlights (remember those from the doctor’s office visits of your youth? ), for ages 4 – 7. One Puzzle Buzz is good for 1/2 – 1 hour’s worth of entertainment/activity. Great for flights and for meals in restaurants. They come two at a time in a subscription, and I hoard them for trips! Colorforms! They work really well on glass (and I imagine tray tables) and pack flat. We have the silly faces set, but they also make shapes and other fun sets. Portable dvd player and Leapster for my older one. For the younger crowd: Aquadoodle, cups, straws, masking tape (no, not for his mouth), ice cubes (a big hit with mine), and a TON of snacks. I also like to give a new wrapped toy for the flight. The newness seems to hold their attention longer than the usual toys from home and opening a present is always a thrill. Love these two new ideas! Teaching Your Child to Be a Global Citizen, One Picture Book at a Time. Doing Right by the Globe-toddling Name. Come Play in My (and Your) Backyard.